Varun Dhawan walked the red carpet at Zee Cine Awards, saw Hema Malini, touched her feet and posed with her. Actor Varun Dhawan attended Zee Cine Awards 2019. He looked dashing in a white suit. However, what stole everyone’s heart was his sweet gesture for veteran actress Hema Malini at the red carpet of the show. Varun was clicked by the paparazzi showering the actress with so much respect while walking the red carpet. Hema looked radiant in her pink coloured saree at the award show. Also attending the dazzling night were celebrities like Deepika Padukone, Alia Bhatt, Katrina Kaif, Kriti Sanon, Malaika Arora, Janhvi Kapoor, Sonam Kapoor, Dia Mirza, Sophie Choudry, Radhika Madan, Vicky Kaushal, Ranbir Kapoor, Ranveer Singh, Karan Johar, and Kartik Aaryan among others. Later, at the event, Ranbir and Alia danced together to the tunes of the actress’ popular song Ishq Vala Love. The pictures of the two actors have gone viral on social media. 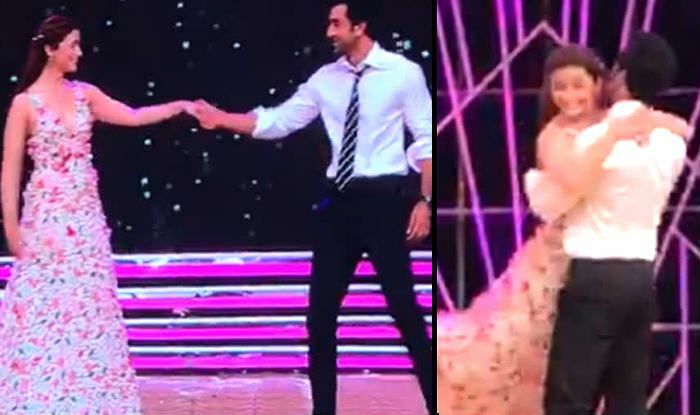 Both Ranbir and Alia look like a much-in-love couple while performing romantically on-stage. In other pictures, the actor is seen carefully walking down Alia off the stage as the talented actress keeps blushing. Reportedly, Alia will be seen bagging the Best Actress award for her performance in last year released Raazi. Watch out!